Miami Trace senior Keondrick Bryant (22) puts up a shot while guarded by Unioto’s Gabe Fisher (33) during a non-league game at the Panther Pit Saturday, Feb. 4, 2017. It was senior night at Miami Trace Saturday, Feb. 4, 2017 and the Panther senior players celebrated a big win over Unioto with a young fan. (l-r); Blake Pittser, Tyrae Pettiford, Tiante Connell, Jalaura Williams, DeAndre Pettiford, Jacob Batson, Keondrick Bryant, Seth Leach, Mitchell Creamer and Skyler McDonald. 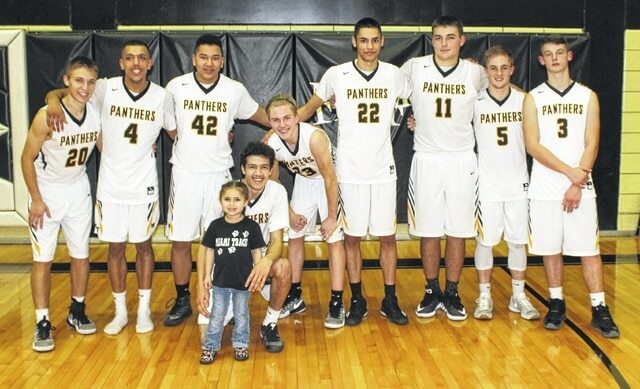 For the second time in as many nights, the Miami Trace Panthers hosted a basketball team from Ross County, playing the game in front of a large crowd at the Panther Pit. On Friday, Miami Trace won a critical SCOL match-up against Chillicothe, 68-65. This victory gave the Panthers a two-game lead over the Cavaliers and the Wilmington Hurricane in the SCOL standings. On Saturday, the Panthers rallied again from an early deficit, this time of 14 points, to defeat the Unioto Sherman Tanks, 68-61. The win elevates Miami Trace to a record of 15-3 overall. The Shermans are now 14-4 with the loss. Senior DeAndre Pettiford scored 14 points, including going 10 of 16 from the free throw line. He led the Panthers with four assists. Senior Tyrae Pettiford had 13 points, including two three-pointers, one slam dunk and one blocked shot. Junior Cameron Carter had eight points, including two three-point baskets. Carter was second on the team with seven rebounds. “Both of us came in tonight 14-3,” Miami Trace head coach Rob Pittser said. “There’s a chance this could have been a tie-breaker for a top seed in the Sectional. Who knows? (The Sectional drawing will be Feb. 12). “It was nice to see our kids rally,” Pittser said. “We’ve been pretty good at counter-punching when teams have gotten a lead on us up to this point in the year and we did that again tonight with a really strong second half. “The thing I like was, once we got that eight or nine-point lead, we handled it much better than we did last night,” Pittser said. “We didn’t turn the ball over a bunch. We made some free throws down the stretch and kept that lead where it was. That’s comforting for a coach to see from one night to the next that we made that adjustment. “Blake made some huge shots for us in the third quarter,” Pittser said. “That kind of rallied us there, especially when they went into a zone. We got a couple of big threes from him and that kind of spurred us tonight, offensively. A fast start by Unioto and an equally slow beginning by Miami Trace saw the Shermans jump out to a 17-3 lead. The game’s leading scorer, Unioto’s Logan Swackhammer, hit four three-point baskets in the first quarter to help ignite the run. Miami Trace had cut the deficit from 14 to seven by the end of the first quarter (20-13). The Panthers cut into the Sherman’s lead by two more points in the second quarter. However, at the half, Unioto was in front by eight, 33-25. The big turnaround came in the third quarter. 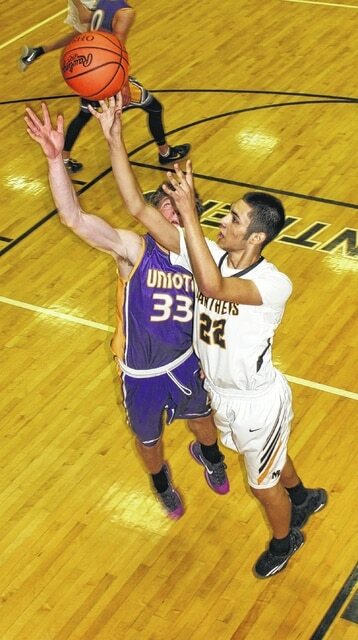 Unioto bumped its lead up to nine points before the Panthers began the rally in earnest. Tyrae Pettiford hit two threes, Seth Leach took a charge, which always fires up the crowd; Darby Tyree hit a bucket, Tyrae Pettiford then had a slam dunk and Pittser scored, finally tying the game, 39-39. Unioto got the lead back to four, 43-39, before back-to-back threes by Pittser put the Panthers in front, 45-43 at the end of the third quarter. The Panthers held the lead throughout the fourth quarter. Another three from Pittser and then a steal and layup by Pittser gave the Panthers a 53-43 lead. Miami Trace was able to keep the lead in the seven to 10-point range throughout the remainder of the game. “We started out hot,” Unioto head coach Matt Hoops said. “We know Miami Trace is an explosive team. We knew a run was coming. We tried to weather it the best we could. One of the keys to the game was Miami Trace scoring 18 points off turnovers. Meanwhile, Unioto scored just one basket off a Panther turnover. Unioto had 20 turnovers in the game, to just eight for the Panthers. Miami Trace’s bench outscored Unioto’s bench, 15-9 and second chance points were in favor of the Panthers, 17-12. The Panthers made 23 of 53 field goal attempts for 43 percent. Unioto was 21 of 47 from the floor for 44 percent. In three-point shooting, the Panthers made 8 of 18 for 44 percent to 5 of 16 from behind the arc for the Shermans for 31 percent. Unioto was better at the free throw line, 14 of 19 for 73 percent to 14 of 25 for 56 percent for the Panthers. Unioto is back in action Friday at home against Ross Southeastern. The Panthers are at home Tuesday against McClain. The freshman game starts at 4:45 p.m.
MIAMI TRACE — Blake Pittser 5 (4)-2-24; DeAndre Pettiford 2-10-14; Tyrae Pettiford 3 (2)-1-13; Cameron Carter 1 (2)-0-8; Keondrick Bryant 1-1-3; Darby Tyree 1-0-2; Seth Leach 1-0-2; Mitchell Creamer 1-0-2; Jacob Batson 0-0-0; Tiante Connell 0-0-0; Skyler McDonald 0-0-0. TOTALS — 15 (8)-14-68. Free throw shooting: 14 of 25 for 56 percent. Three-point field goals: Pittser, 4; T. Pettiford, 2; Carter, 2. Rebounds: 27 (12 offensive). Assists: 10. Steals: 12. Blocks: 2. Turnovers: 8. Personal fouls: 13. Bench points: 15. Second chance points: 17. Points off turnovers: 18. UNIOTO — Logan Swackhammer 4 (4)-8-28; Peyton Hill 7-2-16; Gavin Ogan 2-1-5; Branden Kennedy 0 (1)-1-4; Trey Ivy 1-2-4; Casey White 1-0-2; Gabe Fisher 1-0-2; Clay Elder 0-0-0. TOTALS — 16 (5)-14-61. Free throw shooting: 14 of 19 for 73 percent. Three-point field goals: Swackhammer, 4; Kennedy. Rebounds: 34 (11 offensive). Assists: 7. Steals: 4. Blocks: 0. Turnovers: 20. Personal fouls: 22. Bench points: 9. Second chance points: 12. Points off turnovers: 2.
https://www.recordherald.com/wp-content/uploads/sites/27/2017/02/web1_Keondrick-Bryant-v-Unioto-2-4-2017.jpgMiami Trace senior Keondrick Bryant (22) puts up a shot while guarded by Unioto’s Gabe Fisher (33) during a non-league game at the Panther Pit Saturday, Feb. 4, 2017.
https://www.recordherald.com/wp-content/uploads/sites/27/2017/02/web1_MT-seniors-with-little-girl-2-4-2017.jpgIt was senior night at Miami Trace Saturday, Feb. 4, 2017 and the Panther senior players celebrated a big win over Unioto with a young fan. (l-r); Blake Pittser, Tyrae Pettiford, Tiante Connell, Jalaura Williams, DeAndre Pettiford, Jacob Batson, Keondrick Bryant, Seth Leach, Mitchell Creamer and Skyler McDonald.